used a variation of prescribed moisturisers, such a Diprobase (excuse the spelling) and Eumovate, but find they are too heavy and thick on my skin therefore do not rub in very well. (Heavy creams/lotions like that aren't good for your face either). Due to my ever long search for a good moisturiser I tend to go for the cheaper products as I get through them so quickly. 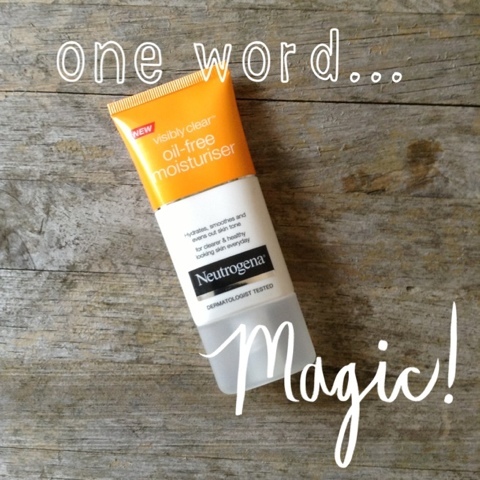 So anyway here's where I discovered Neutrogena's oil- free moisturiser. It was half price and standing out from the crowd so I decided to try it out. I bought this a few months back and have used it UN-sparingly everyday and have only just needed to repurchase. It blends in like butter and lasts from the moment I apply it untill when I eemove my makeup (usually before bed so a good 12/13 hour day! After a few minutes of applying, it leaves this really refreshing zingy feeling on my face which I love as it makes my face feel so fresh, soft and clean! It's really light so doesn't feel cloggy on my skin and leaves my skin so soft when I take my makeup off. Not only is it lightweight but it can be used on any skin type! It's oil-free which means if you suffer from oily-combination skin, you can still rake the same benefits from this moisturiser as every other skin type. Also, as this is part of the 'visibly clear range' it can be used on problem skin too. All rounder if you ask me!! I believe this product is around £4.50 RRP but usually has an offer on! You can find it at 99% of all drugstores and supermarkets e.g boots and tescos, so knock yourself out!! No need to spend lots of money on a product when often you find the label is the only expensive part of the product!! All in all if your skin is like mine and your forever in need of a moisturiser (handbag friendly too) then this is the product for you!! Have you tried this product before and liked it as much as me?